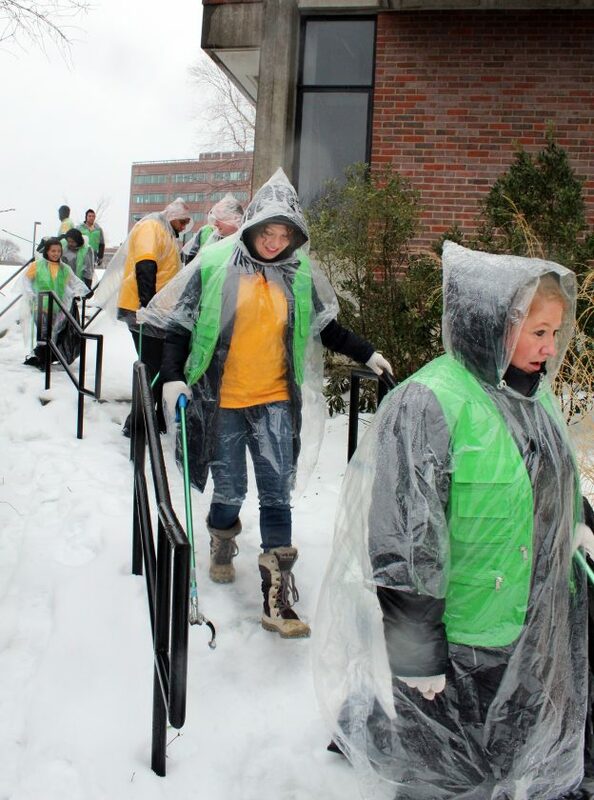 Telegraph photo by DEAN SHALHOUP A cold rain and treacherous walking conditions didn't deter a group of World Mission Society Church of God volunteers from navigating the ice-covered steps to the Nashua Riverwalk for Sunday's cleanup effort. Telegraph photo by DEAN SHALHOUP Led by organizer Americo Imperatore, right, volunteers from World Mission Society Church of God start off Sunday’s Nashua Riverwalk cleanup project with a motivational cheer. About two dozen volunteers braved the rain and treacherous walking conditions to take part in the project. Telegraph photo by DEAN SHALHOUP A cold rain and treacherous walking conditions didn’t deter a group of World Mission Society Church of God volunteers from navigating the ice-covered steps to the Nashua Riverwalk for Sunday’s cleanup effort. Telegraph photo by DEAN SHALHOUP Giselle Diaz, right, gets some help from Michelle Lucier to dislodge some trash from the snow during Sunday’s Nashua Riverwalk cleanup project. They were among two dozen volunteers from the World Mission Society Church of God to brave the elements to take part in the project. NASHUA – The promotion of “health and happiness” being one of the tenets of the World Mission Society Church of God philosophy, some two dozen volunteers from the Hudson-based church braved a steady rain and treacherous footing conditions Sunday to take part in a cleanup of a section of the Nashua Riverwalk. Wrapped in clear, hooded ponchos, protected by high boots and gloves and wielding rubber-tipped “grabbers,” the young men and women faced perhaps their most formidable challenge at the start of the 2 1/2 hour project: remaining upright while descending the several sets of ice-caked steps leading to the Riverwalk’s Nashua Public Library entrance. A non-denominational church, World Mission Society Church of God, often referred to as simply Church of God, meets locally at 290 Derry Road in Hudson. The church focuses heavily on volunteerism to fulfill its mission, a multi-pronged effort that includes environmental protection, large-scale blood drives, visiting the elderly and infirm, and disaster relief, among others. Project spokeswoman Erika Cordova said in planning the event the volunteer team met with Mayor Jim Donchess, who helped them identify a location that would most benefit from a clean-up effort. Telegraph photo by DEAN SHALHOUP Giselle Diaz, right, gets some help from Michelle Lucier to dislodge some trash from the snow during Sunday's Nashua Riverwalk cleanup project. They were among two dozen volunteers from the World Mission Society Church of God to brave the elements to take part in the project. They formed a partnership with the city Parks and Recreation department for the project, Cordova said. Supervising Sunday’s operation was church member Americo Imperatore, who got things rolling by gathering the volunteers in a big circle for a mini pep rally that culminated in a cheer.